The presence and impact of big data in the modern world is growing exponentially as the Internet of Things (IoT) expedites the creation of new data with data sources shifting beyond just the computer screen to household appliances, wearable devices, smart cities, self-driving and electric cars, and more. So first of all, what is big data? According to the Harvard Business Review, big data refers to the vast volumes and types of information that companies can now collect and process using increasingly high-tech systems. In the past, primarily big businesses used big data, largely due to the high costs of the technology used to collect and analyze data. However, today, there are cost-effective and efficient ways to collect, store, analyze, and transfer vast amounts of information that has opened the doors to businesses of all sizes across all industries. Read more to understand the current state of big data, its capabilities and what it means for how businesses perform. Companies can accumulate vast amounts of consumer data; however, it’s what companies do with the data that is significant. 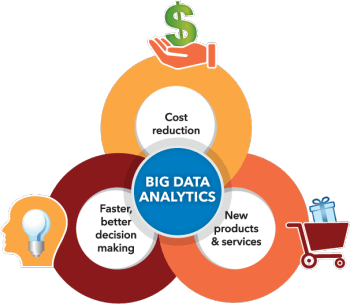 Analyzing big data for trends and insights allow companies to better understand consumer interests, which is essential in assessing whether they are meeting market needs and making improved strategic decisions. The closer the market can predict consumer habits, the better the market is at meeting the needs of consumers. In an age where technology is businesses’ main mode of engaging with consumers and subsequently providing them with what they want, big data becomes an essential function of our daily lives. Whether the result of analyzing consumer trends or surveys and questionnaires, businesses are turning to big data to know where they stand with their customers and learn how to serve them better. As the sophistication of data advances, businesses have access to more comprehensive reports regarding their performance. Back in the day, surveys were conducted in person, taking weeks or months to be returned and subsequently analyzed. People were hired to conduct the surveys, read them, and formulate conclusions. Now, however, artificial intelligence and marketing software can do this almost instantaneously. The only thing businesses need to do is direct the technology on what it should be looking for. Online advertising is getting increasingly personalized. Information on customers’ previous search and browsing history, past purchases, and website interactions are collected and used to infer things about them, such as their tastes and interests to make recommendations that are more likely to appeal to them. This is clear with applications like Spotify, which use algorithms based on previous listening history to determine other songs and playlists that the listener might also like. People are in general agreement that these algorithms are successful in picking music that they enjoy. This same technology extends into the realm of advertising on sites like Google and Amazon, which often suggest products that the consumer may not necessarily have thought of, but might interested in purchasing based on previous searches and purchases. This is beneficial to consumers in the sense that nearly every site they view is providing them with an experience tailored to them. Big data is one of many tech trends captivating the interest of investors, given the promising developments taking place in this sector and the opportunity for diversification it provides. The Evolve Innovation Index ETF (EDGE) gives investors exposure to a number of key players in big data and cloud computing.